When Grey Trace’s wife is murdered and he’s left paralyzed after an assault, he is offered a piece of technology that helps him walk again, which sends him on a path to avenge his wife. Upgrade has a clever science fiction concept boasted by great action and directing. It takes a while for the adrenaline to kick in, as the first 20 minutes aren’t interestingly written and feel dull in terms of style, but when the story really begins, the movie picks up and becomes and engaging ride. Logan Marshall-Green isn’t one of the biggest Hollywood stars right now but this isn’t the first time I’ve seen him in a leading role and he impresses me every time. He not only brings charisma to the main character but also emotional strength which he demonstrates in some scenes. The action is very well done and always entertaining, as the cinematography is creative and the over-the-top blood is fitting and adds to the excitement of the violence. The movie raises some interesting questions about technology and how far its usage could go, and though it struggles with making its villains and side characters as strong as the hero (none of the characters besides the lead are any memorable), it’s got some note-worthy action sequences and suspense, as well as a brilliant twist ending. I was also amused by the quality of the visual effects for such a low budget film. 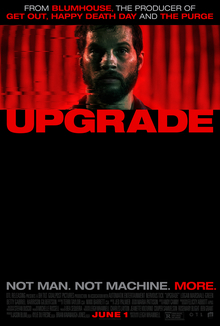 Upgrade looks impressive and also has a solid plot and thoughtful elements that fans of action and science fiction can enjoy. This entry was posted in Action, Science Fiction, Thriller. Bookmark the permalink.